She sobbed quietly as she tightly grasped her mother’s hand in a cooler-than-usual late July morning. He grips my other hand with a soft, nonchalant grip as he eagerly walks, for the first time, to the bus stop. 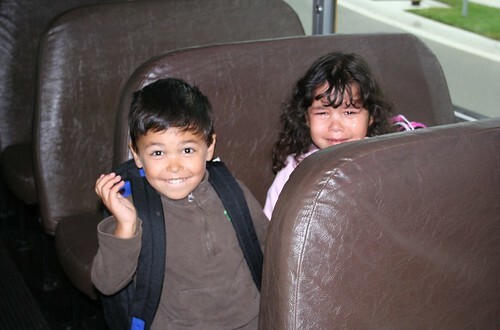 The first day of Kindergarten was very typical for both Swee’Pea and TheMonk. Swee’Pea had good moments and rough moments, including some all-out tears. TheMonk had some trepidation at first but quickly decided he liked Kindergarten and fell in line with all the other kids quickly. But that first day was just a couple of hours while Mommy and Daddy were in the teacher and a couple more hours without Mommy and Daddy. The second day would be the first full day and it would begin with their first ever ride on a school bus. As the bus arrives, the nervous Swee’Pea begins to cry. We carry her on the bus and the bus driver, a nice older gentleman, tries to comfort her. We find a seat near the front and Swee’Pea and TheMonk sit down. I ask TheMonk to hold his sister’s hand and he does so dutifully. But it is clear that he is in awe of his surroundings and loves being on that bus. It is also clear that Swee’Pea feels just the opposite. So Mommy and Daddy exit the bus while we watch Swee’Pea cry from afar. Soon, the bus is loaded up with 32 excited kids and one scared, crying kid and they are off. As great of a responsibility I have, as a parent, to teach my children the lessons they will need to grow up to be non-felons, it has become apparent that an unexpected bonus of this parenting gig is how much Swee’Pea and TheMonk have taught me. These are serious considerations and since it is my job to ensure the kids get off to preschool (which is rapidly winding down, but that’s another blog post), I am often challenged to get my day started by two five-year-olds who insist on making farting jokes instead of getting their shoes on. Inevitably, I’m herding two little ones into a car while trying not to spill my morning cup of coffee all over my non-iron shirt that was recently sprayed liberally with wrinkle releaser. “C’mon, Swee’Pea! We’re late, Honey. Please hurry!” I implore. Swee’Pea might hurry for a brief second or two – long enough to give me hope that she’s finally decided to get in gear but, inevitably, she stops to pick yet another flower. And as we finally get closer to the door, I might beseech one last time, and she’ll finally listen and scamper her skinny little legs over to me while I hold the door open for her. She and her brother enter and as we put their things in their cubbies and get ready to join their friends on the playground, I bend over to give hugs and kisses. As I receive my hugs and kisses, Swee’Pea thrusts her tiny bouquet of yellow Dandy Flowers in my face and says, “Here Daddy. I picked these for you to take to work.” I take the flowers gently in my own hand and as I say my goodbyes and wander down the hall towards my car waiting outside, suddenly the world doesn’t seem so crazy and it slows down enough around me to allow me to grasp what’s really important. And I clutch the rapidly wilting flowers in my fingers and try and remember that before long, picking flowers for Daddy won’t be as high on her priority list. So I stop and smell the Dandy Flowers. I’ve never smelled something so sweet. Even that Snicker’s bar in the fridge.